The Navy on Thursday announced punishments for the leadership of the USS Fitzgerald, a destroyer that crashed into a merchant ship in Japanese waters in June leaving seven sailors dead. The ship's commanding officer, executive officer and senior enlisted officer were all relieved of their responsibilities aboard the ship, Navy officials said. The admiral of the 7th Fleet felt that “serious mistakes were made by the crew" of the Fitzgerald during the June collision with a Philippine container ship that led to the death of seven sailors, according to Admiral William Moran, the vice chief of naval operations. He said "the bridge team" — the sailors responsible for keeping watch on the ship's bridge to ensure it remains safe — had "lost situational awareness," which left them unable to respond quickly enough to avoid the disaster once the oncoming container ship was spotted, according to the Associated Press. All three of the ship’s leaders will face administrative action at a so-called “Captain’s Mast” meeting on Friday in Japan, officials said. Additionally, up to a dozen other sailors will face non-judicial punishment. 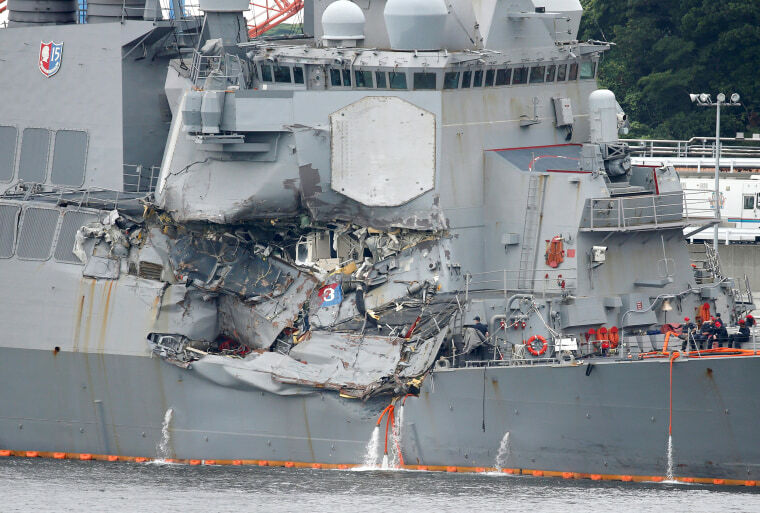 Two other naval investigations continue into the crash, where the Navy destaroyer collided with the merchant ship southwest of Yokosuka, Japan, in the early hours of June 17. The bodies of the sailors were found in flooded compartments, the U.S. 7th Fleet said the following day. Those seven sailors were posthumously promoted on Wednesday. Twenty-eight other sailors were able to escape. A Navy review of the incident found that the deaths could not be blamed on misconduct and commended the response of the ship's crew following the collision, according to the AP. "No damage control efforts, however, would have prevented Berthing 2 from flooding completely within the first two minutes following the collision, or the deadly circumstances in that situation," the review said. The berthing cabin of the ship flooded within 90 seconds of impact and many sailors behaved heroically to save the ship from sinking. The captain, at one point, was hanging onto the side of the ship and had to be rescued by the crew. His cabin was directly impacted by the collision with the cargo ship. "They had to fight the ship to keep it above the surface. So it was traumatic," U.S. 7th Fleet commander Vice Admiral Joseph P. Aucoin said at a press conference at the time, "I can't tell you how proud I am of the crew for what they did to save the ship," he said. Daniella Silva and Associated Press contributed.